Herman den Blijker is one of the most media-savvy and popular chefs in the Netherlands, especially since he has hosted several cooking shows on TV and is the author of several bestselling books. And despite his megalomaniac tendencies, the old boy is undeniably very gifted. His flagship restaurant, the Las Palmas – once adorned with a Michelin star – is a great place to discover his notorious talent. Arguably, Herman den Blijker invented the concept of a Dutch brasserie. 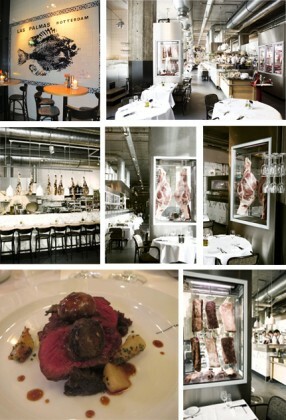 When one enters the huge industrial loft, you are greeted by a window displaying pieces of hanging meat. Something that might be surprising to those familiar with this address who have long been ordering nothing but fish from his menu! But Herman den Blijker knows how to evolve. And when he decides to cook meat dishes, he certainly doesn’t do it by half measures: the meat dishes on his menu have been perfected and finely tuned by him over a long period of long time. Las Palmas quickly became known as one of the places in Rotterdam where they serve the best meat, cooked in small ceramic barbeques…designed by Herman den Blijker himself! As soon as one tastes a piece of the Scottish Black Angus with truffle, which is totally flawless, we forgive the cult of personality that is Herman den Blijker.